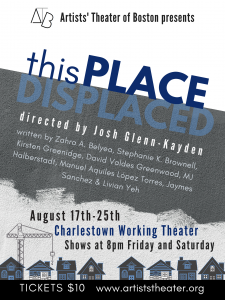 Meet David Valdes Greenwood, Boston native, nationally-acclaimed playwright, and just one of eight playwrights working on ATB’s new documentary theatre project This Place/Displaced, to give voice to stories of displacement, gentrification, and housing inequity in Boston. As the performance approaches, we reached out to David to find out a little bit more about his writing process and what this place (pun intended) means to him. Join us at Charlestown Working Theater August 17-25 to see Nunca Termina and seven more new plays! A lot of my work involves me having conversations with people living the lives of and navigating the dilemmas of the protagonists, and it always rewrites my imagination, yielding something truer than I would have created. When characters have a walk that I don’t — the nonbinary and trans roles in The Mermaid Hour, for instance — my job is to hear, be humble, and let those who know lead the way in what is true or not true. I have mostly worked in fictional narratives, so basing an entire play off interviews is new, but I did write an entire book this way, so I am comfortable with the process–the scary part is that you go in never knowing what the arc will be or if you will find one for sure. Frezzia, my subject here, provided plenty to work with–she is a natural hero for a story: she faces obstacles, gears up, and takes them on! What is your connection to the Boston area and how has this city impacted your life? I was born at the old Boston City Hospital and lived the first two years of my life on the Jamaica Plain/Roxbury line. At the time, it was a neighborhood almost all of factory workers like my parents, many of them immigrants (the majority of the workers at this factory were Cuban). We moved away and I did not live in Boston again until grad school in 1992, and I have stayed in or just outside the city for the last 25 years. When I chose to return to Boston, it was to be in a diverse city, but the more time I spent here, I realized how much the diversity was kept siloed. In the past few years, I have made it part of my mission as a writer to emphasize intersectionality and diversity in my work, and have been grateful to work on projects with companies who share this mission, including Company One, Fresh Ink, Theater Offensive, and ATB locally. Caryl Churchill–she is interesting in playing with what theater can look like, sound like, and feel like. Our comfort is not on her agenda. Ideas are the fuel that stokes her fires and she demands we pay attention to them. David Valdes Greenwood is the author of plays staged across the US and abroad. 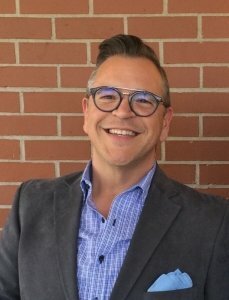 In addition tothe 2018 National New Play Network “Rolling World Premiere” of The Mermaid Hour in Tucson,Portland, Minneapolis, and Charlotte, his most recent productions include Full Code withBoulder Ensemble Theatre Company and Raggedy And with Pride Films & Plays. His play, The Last Catastrophist was developed by Company One and The Huntington Theatre Company in 2017, andhe is currently working on Up the Ladder, Down the Slide, a play about parenting one’s own parents through decline. The son of a Cuban refugee, he is doing research for a project on narratives of the undocumented experience in Boston.